I introduce map presentation in the previous chapters. In general, it is enough to simple games; but we need to spend more energy on the map to simulate real world and achieve more realistic effect. 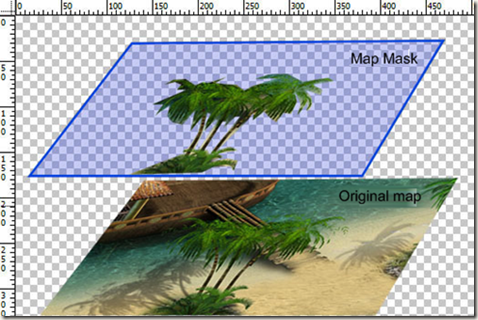 This chapter will focus on how to implement map mask. First, let’s have a look at what a complete map should include. 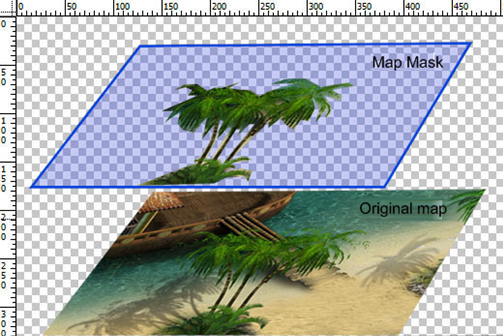 From the picture above, we can see that the bottom picture is the original map, shown in the game. We have discussed it before. Now let’s put our attention on the top picture. It is a tree, when the sprite moves behind the tree, he will be masked by the tree, so we called it “mask”. We cut this tree from the original picture, make the image’s background transparent. And last, we add all these picture in the canvas, the sequence from top to bottom is: mask, sprite, map. Make sure all the masks are put in their proper position where they stay before in their original picture. The principle sound reasonable. Let’s implement it in code now. OK, let’s modify the code base on the demo in Chapter 10. 1st, set up 3 obstructions in the method InitMatrix. 2nd, set up two mask. From the code above, I set the mask1’s ZIndex property to 10000 in the canvas, because the map size is less than 10000 in width and height, the mask will always in front of the sprite. You can also find I set the mask1.Opacity to 0.7, so if the sprite move behind the tree, he won’t be hidden by the tree completely, we can still see him, because it’s easy to control the sprite, although the sprite image is not so clear, more or less. OK, press Ctrl+F5, and move the sprite behind the tree, we can see that the sprite was “hidden” from our view. And we also need to set the mask’s ZIndex property to its actual value, rather than 10000. But it is not the right time to do this modification, I will leave this issue until I set up a sprite control, I will set up a DependencyProperty in it and implement this dependency between the top and the ZIndex properties. BTW, in the game domain, we call this technique that hidden-appear in multiple layers as Painter Algorithm. Summary: This chapter introduces map mask and part of the Painter Algorithm. Next chapter, we will focus on another map type, Instance, which can help us to detect the region by picking up the colors. Please focus on it.